Buy books from the editors of Bon Appétit! 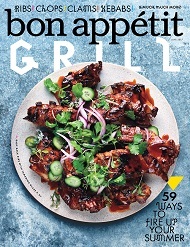 BON APPÉTIT is America's favorite food and entertaining magazine! Every issue delivers over 75 new recipes for everything from delicious appetizers to fabulous desserts. You'll also get expert wine advice, practical cooking tips, menus for fast suppers, and suggestions for cozy weekend getaways. Subscribe today for just $1 an issuea savings of 71% off the cover price!